You are here: Home / Masonic Traveler / BSA100 – Boy Scouts of America, 100 Years of Being Prepared. 2010 marked a significant milestone in the lives of young men all across the continent as the Boys Scouts of America celebrated its 100th Anniversary. Started in 1906 the Boy Scouts, in the course of a few short years and group mergers, took its present shape in 1910 to become the premier young mans organization that it is today. 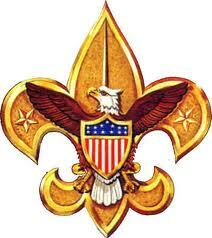 Premier because few organizations produce the quality young men that the Eagle Scout embodies. For its adult leadership, the Wood Badge is the mature persons Eagle Scout equivalent which embodies the spirit of the Scouts into the adult leader who assumes the leadership role to guide the young men up that progressive climb. Said by some to be a quagmire of paperwork, the BSA is a mostly volunteer organization composed of parents and interested community members to guide its course. At the local level, troops (like lodges) are individually chartered and provide a space in which the member boys meet. Like Freemasonry, the Scouts are a private membership organization that through and through is values-based. At its core is the teaching of being a responsible citizen, character development, educational programs, and self-reliance through participation in a wide range of outdoor activities. 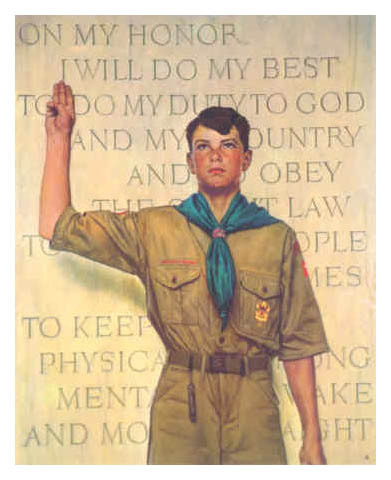 Both statements are meritorious to any individual that applies them to their life, but the Boy Scouts weave these ideas into the very fiber of the organization such that it becomes as much a part of the members being, as the characteristic brown and green uniform. It is very much a way of life, with an optimistic way to look at a past ideal of social virtue and civic engagement, something little seen today and even less instilled in young men. This social virtue is so much a component of the Boy Scouts that the highest rank, the Eagle Scout, is predicated on the completion of a service project for one of the communities in which the scout circulates. By its very conduct it is very easy to see that the ideal of a Boy Scout sums into the ideal of Leadership, Achievement, Character, Service, and Environmental Appreciation (did I mention the Scouts camp a lot?). From a Masonic point of view, we can see the similarity to the aims of the organization in its workings. Both have a progressive line of promotion that elevates the junior member to a higher standing within the body – Tenderfoot to Eagle/Apprentice to Master – predicated on a set of civic principals and virtues of self improvement. In the Masonic Lodge, the degree of Master as the most common level of lodge practice, the Scouts conduct meetings with all grades in attendance and impressively with greater participation, as they see all the participants as contributors to the units prosperity. This mixed rank participation allows more experienced members to interact with younger scouts to teach, train, and impart their experience to those who will one day hold those elder leadership positions. Unlike Masonry, the Boy Scouts has an age cap in which the youth in attendance need progress to his ability before he comes of age at 18. There is some latitude for those working on their Eagle Rank, but essentially, the Scouting door closes at the 18th birthday. That does not, however, eradicate the youths ability to continue on with the experiences of Scouting as there is a secondary body called the Venturing which has an older age ceiling with further rank advancement and meritorious awards. But, once a scout always a scout and opportunities abound for mature scouts to volunteer with his troop, mentor up and coming scouts, and evolve into a Scout Master in the future. 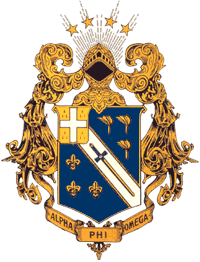 Also, for the college bound scout, there is a college fraternity – Alpha Phi Omega or APO which is roughly 17,000 students strong and more than 350,000 alumni. The purpose of APO is a service fraternity with principals derived from the Scout Oath and Law to promote leadership and service to humanity. This collegiate fraternity is a natural next-step for any Scout looking to continue his scouting path at university. One important aspect of the Boy Scouts is faith, something that is inherent in scouting, but not in a fundamental way. Scouting encourages each young person to begin a spiritual journey through the practice of his or her faith tradition. One of the key tenets of Scouting is “duty to God.” While Scouting does not define religious belief for its members, it has been adopted by and works with youth programs of all major faiths. This is very similar to the Masonic ideal of faith in a supreme being with out an expressed definition of what that faith is. Unlike the Scouts, Masonry uses the Bible as the principal sacred book where as the scouts have developed a Religious Emblems Program to broaden the individual scouts faith and honor the various faiths of its membership. The groups range from the African Methodist Episcopal Church to Zoroastrianism. Now that we have an idea of who and what the Scouts are today the next logical step is to look at where the Boy Scouts of America came from, which presents some interesting insight to the zeitgeist of the beginning 20th century and some possible unseen Masonic connections at its origin. I joined the Boy Scouts on the occasion of BSA’s 50th Anniversary. My Eagle Certificate was signed by Lyndon Johnson. General Hershey was the Head of the organization at the time; also the head of Selective Service. We wondered if there was a deliberate coincidence there. What is means to be a Boy Scout is to move toward responsibility. This is done by personal, organizational, familial and civic advancement and learning. As a Boy Scout learns, he takes on broader and broader duties to himself, his family and his community. Always with support, but allowing him to go out on the springy branches. When I was 15 years old, I was hired as a counselor at Camp Theodore Roosevelt, the oldest Boy Scout Camp in the world at the time, dedicated to and by Bro. Roosevelt. I was put in charge of the outdoor sports program for 250 campers, including rifle, shotgun and archery. I had two men to supervise (nominally) who were Marine rifle instructors. It is rare for a 15 year old to be trusted with this sort of responsibility, but not in the Boy Scouts. Additionally, I was responsible for my own health, cleanliness and finances. These were the days when there were slot machines in Maryland, and we had the opportunity, not sanctioned by the BSA, to lose every cent we made on the one armed bandits. A quick way to learn how to hold onto money. Also how to lose it fast. From sundown ’til dawn we were pretty much on our own. Being a Boy Scout isn’t about rubbing two sticks together, or about being a patriot, or a religious person. It’s about learning and growing into a well rounded, liberal person. I have been involved in scouting for 57 yrs. and held every volunteer “job” there is at unit, district and council levels. I have been involved in Masonery 64 yrs and thrice W.M. I wish every lodge would sponsor a scouting troop. We could make unbelievable impact o n our communities together. Brethren, fraternal Greetings from the United Kingdom. Can anyone offer any assistance please or point me in the right direction please. I am an Assistant County Commissioner in Greater Manchester West Scout County and would like to bring a contingent of our Scouts over to the USA in 2019 for an expedition culminating in a visit to the Jamboree site. I attended Philmont as a boy back in 79 when the Jamboree to Iran was cancelled and had an absolutely fantastic time and it has always been my dream to return or possibly attend Seabase in Florida. If this is not possible we could run expeditions anywhere in the States but I am starting from the bottom having no contacts whatsoever. Could anyone please help. Steve Ralph Provincial Grand Steward, Province of West Lancashire, United Grand Lodge of England. I know this is over two years on, but I am just finding this web page and in doing so, I see it appears no one has replied. I worked the BSA 2017 National Jamboree and I am planning on working the World Jamboree in 2019. how can I help? I hope this message makes its way to you.